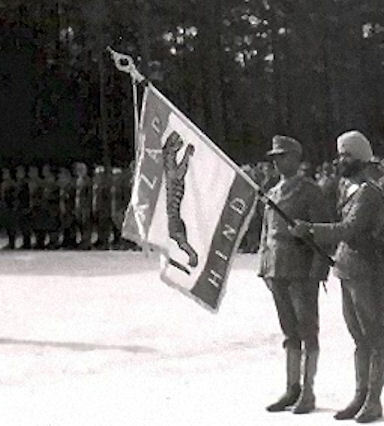 The Legion Freies Indien (Free Indian Legion) / Infanterieregiment 950 (Ind.) was a regiment of the German Army formed from Indian volunteers in 1942. The initial recruits came from among the small number of Indian students resident in Germany during the Second World War together with a handful of volunteers from the large numbers of Indian POWs captured by the Axis forces during the North African Campaign. Initially conceived as the vanguard of a German-Indian invasion of the western frontiers of British India, only a tiny number of men were ever to reach their homeland. The overwhelming majority of the troops of the Free Indian Legion were only ever to see service in Europe - mostly as part of the defensive garrison of the Atlantic wall in the Netherlands and in France. Following the Allied invasions in the summer of 1944, the Legion was forced into a fighting withdrawal across France which involved many violent skrimishes with the French Maquis before it reached temporary sanctuary in Germany. Shorty before the surrender of the Third Reich in 1945, the troops of the Free Indian Legion marched through the Alps in an efforts to enter neutral Switzerland, but these labours proved futile as they were refused entry and captured by American and French troops and eventually shipped back to India to an uncertain fate at the hands of the British.